American soldier, was born at Litchfield, Connecticut, on the 10th of January 1739. He removed, probably in 1769, to the "New Hampshire Grants," where he took up lands, and eventually became a leader of those who refused to recognize the jurisdiction of New York, and contended for the organization of the "Grants" into a separate province. About 1771 he was placed at the head of the "Green Mountain Boys," an irregular force organized for resistance to the "Yorkers." On the 10th of May 1775, soon after the outbreak of the War of American Independence, in command of a force, which he had assisted some members of the Connecticut assembly to raise for the purpose, he captured Ticonderoga from its British garrison, calling upon its commanding officer -- according to the unverified account of Allen himself -- to surrender "in the name of the great Jehovah and the Continental Congress." 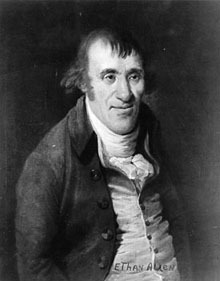 Seth Warner being elected colonel of the "Green Mountain Boys" in July 1775, Alien, piqued, joined General Philip Schuyler, and later with a small command, but without rank, accompanied General Richard Montgomery's expedition against Canada. On the 25th of September 1775 near Montreal he was captured by the British, and until exchanged on the 6th of May 1778 remained a prisoner at Falmouth, England, at Halifax, Nova Scotia, and in New York. Upon his release he was brevetted colonel by the Continental Congress. He then, as brigadier-general of the militia of Vermont, resumed his opposition to New York, and from 1779 to 1783, acting with his brother, Ira Allen, and several others, carried on negotiations, indirectly, with Governor Frederick Haldimand of Canada, who hoped to win the Vermonters over to the British cause. He seems to have assured Haldimand's agent that "I shall do everything in my power to make this state a British province." In March 1781 he wrote to Congress, with characteristic bluster, "I am as resolutely determined to defend the independence of Vermont as congress that of the United States, and rather than fail will retire with the hardy Green Mountain Boys into the desolate caverns of the mountains and wage war with human nature at large." He removed to Burlington, Vermont, in 1787, and died there on the 11th of February 1789. He was, says Tyler, "a blustering frontier hero -- an able-minded ignoramus of rough and ready humour, of boundless self-confidence, and of a shrewdness in thought and action equal to almost any emergency." Allen wrote a Narrative of Colonel Ethan Allen's Captivity (1779), the most celebrated book in the "prison literature" of the American revolution; A Vindication of the Inhabitants of Vermont to the Government of New York and their Right to form an Independent State (1779); and Reason, the Only Oracle of Man; or A Compendious System of Natural Religion, Alternately adorned with Confutations of a Variety of Doctrines incompatible with it (1784).